For many corps members and their parents, it's an emotional challenge to be separated for an entire summer. The members wonder how things are going back home, if the pet dog still remembers them and if in their absence their bedroom has been turned into a recreation room. The parents wonder if their child is eating well, getting enough sleep, remembering to wash behind their ears and has enough money to make it through the season. Now imagine you're a corps member who hasn't seen his parents even once in two years, and imagine you're those parents without any expectation or significant hope of seeing each other during that period and beyond. 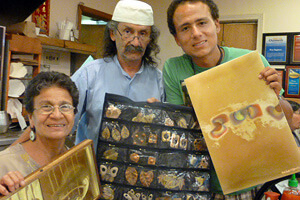 That's exactly the situation that was facing Juan Andr?©s Torres Villaquir?ˇn and his parents. 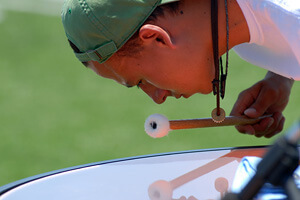 Juan, an international corps member from Ecuador was a first-year age-out timpanist with the Cavaliers in 2011. He hadn't seen his parents since he left two years ago for the United States to become a music education student at Chicago's VanderCook College of Music. And for the members of the Facebook group, Parents of the Cavaliers, that was something they could not let persist. During his first two years at VanderCook, percussion instructors Kevin Lepper and Brett Kuhn, each having taught in the activity, told Juan about drum corps. His classmate and friend Derrick Shannon, who marched with the Cavaliers in 2010, suggested he audition for the corps. Rehearsals were nearby and the summer of 2011 would be Juan's last season of eligibility. "I thought drum corps was just for professionals," Juan said. "I didn't know the corps were made up of high school and college kids who busted their rears all summer." Finally deciding to audition for the corps in the fall and making the cut, Juan said, "I couldn't believe it for two days after they offered me the timpani spot." Juan tunes his timpani during a rehearsal. Even though Juan lived less than 20 miles from the equator, he had never experienced hot days like he found during this past summer. Quito is 9,200 feet above sea level, so it never gets extremely hot. It was quite a shock for him to discover that heat waves off the copper timpani kettles could reach more than 110 degrees. Despite that, he says his summer was made up of nothing but awesome experiences and memories. The story could have ended right there, with Juan enjoying the summer of his life before going back to VanderCook for his last two years of study and then returning to Ecuador to teach. But his mother, folk jewelry designer Mercedes Villaquir?ˇn Paz, discovered the Parents of the Cavaliers Facebook page and became engrossed with the videos and photos the parents posted there. She began to make friends with the other parents and supporters on the page, relying on an online Google translator to convert the text to Spanish. She had asked the members of the group to say hello to her son and in return, they asked her if they could do anything for Juan, such as bring him food or socks. That's when Polly Backes, a corps mother, started to think about the near impossible. When the other parents and supporters learned from Polly that Juan hadn't seen his parents in two years and that he would finish his drum corps career without them ever seeing him perform, many of them were surprised mentioning their angst in not seeing their sons for a few weeks, let alone not seeing their sons for two years. So, the members of the group decided to raise the money to get Mercedes and copper artist father Nelson Eduardo Torres Novillo to Indianapolis from Ecuador for the DCI World Championships. In less than two days, the group raised $4,600, but raising the money was the easy part. With less than 10 days left in July, neither parent had a visa to come to America and Juan's father didn't even have a passport. After Nelson obtained a passport in one day, he and Mercedes tried to get a visa appointment from the United States Embassy in Ecuador. They were told they wouldn't be assigned a meeting until Aug. 18, five days after the end of the DCI season. artworks they hoped to sell to pay for his college tuition. Juan is proud that his parents refused to give up, saying, "They knew they couldn't let down those who got together to make it happen." Members of the Parents of the Cavaliers group talked to the corps' management and got the corps to send out a letter on behalf of the parents to the embassy, explaining that time was of the essence and that the parents would not be coming to America to stay. Cavaliers alumni, many still in college, also sent a flood of e-mails to those at the forefront of the cause, asking how they could help. According to Juan, "Polly started writing letters like crazy and corps volunteers Jan Crowe, Stefanie Kressaty (who has a background in travel arrangements), Thor Schumacher (who knew people who could help expedite matters) and others started pulling strings." Like magic, the appointment got moved ahead to the start of August, with the embassy officials saying the letter from the Cavaliers helped initiate the process. When Nelson and Mercedes arrived in Chicago, Polly picked them up from the airport and provided them food, lodging and transportation. Others stepped in and donated tickets and paid for their hotel room in Indianapolis. "My parents were cared for in every way by parents who themselves were fighting just to pay for their own sons to march," said Juan who was deeply touched by all of this. 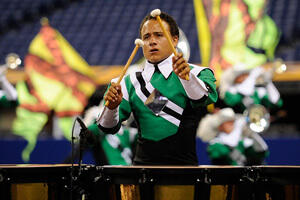 Juan's parents had no idea what drum corps were until they got to witness their first show, which due to the tightness of the schedule to get them to America, was the World Championship Finals at Indianapolis' Lucas Oil Stadium. They admit they were surprised at the professionalism they witnessed on and off the field, almost shocked at how hard all the corps members work. Nelson commented that the hard work was passed on from the marchers to their parents, whose kindness and efforts made them seem like angels in his eyes. Mercedes was especially touched by how the Parents of the Cavaliers appreciated her son's talent and contributions to the corps. The generosity of drum corps parents and fans has had a profound impact on the family, one that will never be forgotten. In summarizing everything that happened, Juan could only repeat, "This is a miracle. This is a miracle."